The KitchenAid Artisan-series mixer has just been introduced in a myriad of colors. It retails for $349.99. Yea, I've always wanted one of these ever since working at Lechmere as a small appliances sales clerk. I can still recall the aisle we featured them in and the boxes were hefty. You could only fit two of them per shelf and there weren't as many colors to choose from. I seem to recall white and black back in those days. But now you can buy these delightful hogs in any color imaginable...well, within reason. They've got my favorite color Yellow available although when I selected their 'majestic yellow' it resembled more of a sunflower hue than a smiley face so I'll pass on that one. I've chosen 'ice' as my favorite color should you want to buy me one. Imagine what a domestic goddess I would be were I to have this 325 watt mixer. I'd be baking homemade cookies. I'd be mixing stuff. Well, I don't know quite what the hell I would do with this monster other than mix cookie batter because that's about the only thing I've ever seen this thing do in person. (Shout out to my pal Stephanie who demonstrated the cookie mixing!) But I could become a baker. Screw that. 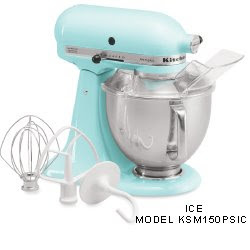 I just want this ice-colored KitchenAid mixer because it's a super unique color and would be fab in my kitchen. Visitors would be under the impression that I was a cook and that's about all I'd be striving for other than their jealousy over the retro color. Shhh! I'm Talking During the Movie. Acupuncher: Punch Your Bunion into Submission!